Colleen first rolled out a yoga mat over twenty years ago when she chose Yoga101 at university, not recognising that the yogic path would be her chosen road. After university Colleen worked as a Toy Designer for several years while maintaining a personal yoga practice. Following the tragic events of September 11th 2001, Colleen found clarity of intention for how she wanted to live in the world and chose to formally train as a yoga teacher. Colleen first qualified as a yoga teacher from Integral Yoga NYC (RYT) 200-hour course based on the eight limbs of yoga. In the USA she taught yoga to adults, children and people with learning disabilities in the NJ / NYC area before relocating to the UK. As a Yoga Therapist, Colleen works with clients on a 1:1 basis as well as teaching to groups. 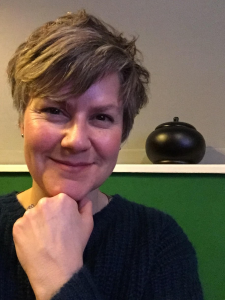 Additional to the Yoga for the Mind 8 week course, Colleen also has experience working within the NHS, teaching yoga to clients with Depression, Anxiety Disorders, and Psychosis. As part of the Minded team, Colleen enjoys supervising new students on the course. Colleen is also an Art Psychotherapist registered with the British Association of Art Therapists and the HCPC.